One of our favorite photographers has an exhibit of one our favorite series … Isa Leshko: Thrills and Chills. If you are down in Houston, you want to visit or check out her gallery photos at the John Cleary site (one of Houston’s preeminent galleries). 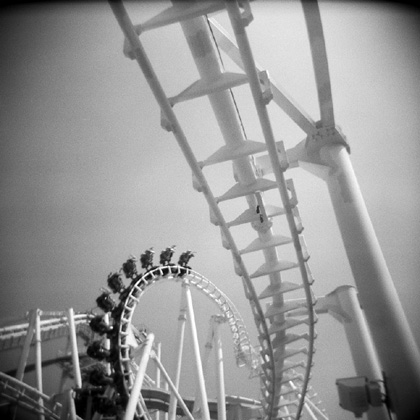 This body of work features black and white images taken at parks, county fairs and along boardwalks using a stripped down Holga toy camera. The exhibition will be on display at Houston Arts Alliance through December 31, 2010. "Amusement park rides terrify me, which is why I began photographing them. I am fascinated by what compels people to surrender themselves to these mechanical beasts. The rides seem to challenge the very limitations of being human. We can’t fly; yet these vertigo-inducing machines allow us to soar through the open air. The experience combines elation with fear; thrills with chills."